Traditional ratatouille is a mix of garlic, onions, peppers, courgettes and aubergines braised with lots and lots of olive oil. It's very healthy, but not exactly low-fat. 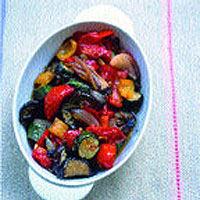 To cut down, roast the vegetables in a hot oven with just a hint of olive oil. Stir in a further tablespoon of your very best olive oil at the end, for flavour and richness. Put the courgettes, onion, peppers, aubergine and garlic into a non-stick roasting pan large enough to fit them in one and a half layers (if the vegetables are more crowded, they'll steam, not roast). Toss with 1 tsp olive oil (or spray lightly with oil from an atomiser). Roast for 20 minutes, stirring 2 or 3 times. Remove from the oven, stir in the tomatoes, and cook for 10 minutes more, till the tomatoes are soft and all the vegetables cooked. Remove from the oven, stir in the extra virgin oil, season to taste, and serve. You could add chopped olives and capers to create a flavourful accompaniment for fish. Try serving the dish with macaroni cheese, or stir in fresh basil and toss with pasta for a simple supper. This recipe was first published in Sat Oct 01 01:00:00 BST 2005.